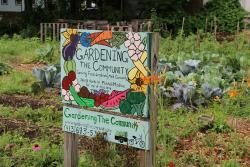 Gardening the Community (GTC) is a food justice organization engaged in youth development, urban agriculture, and sustainable living. We operate on three sites in the Mason Square area of Springfield, where we run a CSA, sell our vegetables at the City Soul Farmers’ Market, and run a newly constructed farm stand (opening in 2018). Gardening the Community (GTC) is a youth-led food justice and urban agriculture organization based in Springfield. We grow organic fruits and vegetables on empty lots and organize for a healthy and equitable local food system. We sell at our Hancock Street farm stand and the Mason Square Farmers’ Market, and run an affordable CSA program called GTC EATS! We grow community, youth leadership, activism, and just food.